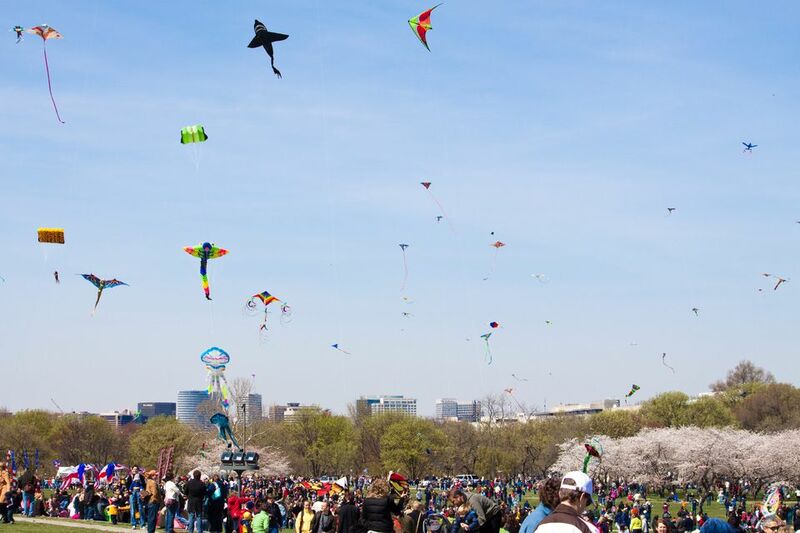 The Blossom Kite Festival, previously named the Smithsonian Kite Festival, is one of the most popular annual events in Washington, D.C. during the National Cherry Blossom Festival on the National Mall. The kite festival features kite fliers from across the U.S. and the world. Kite enthusiasts show off their stunt skills and compete for awards. The event traditionally features five areas to explore and enjoy: the competition and demonstration field, kite club display area, activity tents, family field, and public field. A mini-parade steps off at 10 a.m. to begin the day. There is a full schedule of events for adult and youth competition. Generally held in time with the blooming of the famed cherry blossoms along the Washington Mall, the next festival will be held on March 30, 2019, from 10 a.m. to 4:30 p.m. The festival is held on the grounds of the Washington Monument, at Constitution Avenue and 17th Street, in northwest Washington, D.C. In terms of the easiest transportation options, the most convenient Metro stations are Smithsonian and Federal Triangle. Anyone can enter the competition elements of the kite festival for free. Registration is required. On the competition and demonstration field, experienced kite makers can enter kites mirroring the chosen theme of the year. The kites must be home-made and flown by the kite maker on the day of the competition. On the adult field, you can watch "kite ballet" and other demonstrations in including tricks. Or, you can watch master kite fliers duke it out in a rokkaku battle. Awards are given for various competitive components of the festival. By a show of applause, you can help your favorites win. The popular Rokkaku battle and hot tricks showdown are displays of kite flying showmanship. The adult Rokkaku Battle features hexagonal-shaped fighter kites commonly flown in Japan and now in many other parts of the world. Rokkaku kites traditionally flown in Japan are made of bamboo and washi (fiber) paper. Those at the kite festival are made of more modern construction. In the battle, teams of kite fliers compete to “cut” or “ground” opposing kites. You can take down your opponents by “beheading” them, which means you fly your kite quickly past another, running your line across a single spot on your opponent’s line. That way, their string gets cut, while yours stays intact. The hot tricks showdown is a competition in which multi-line kite fliers engage in a series of one-on-one competitions and maneuver their sport-kites in amazing flight patterns during 30 seconds of music. Children (anyone under age 16) can compete on the family field. Families can also get expert advice and practice new skills. Children do not need to bring kites or experience to the kids’ battles. There are two age groupings for the rokkaku challenge for children: age 5 through 9 and age 10 through 15. Children can also participate in bowl races, in which children race against each other running upwind while dragging a bowl-shaped, parachute-like kite behind them. Throughout the activity tents, children can make a kite, decorate a bookmark and a windsock, receive lessons from experienced fliers, and visit the kite doctor to repair a damaged or broken kite. When Will the Washington DC Cherry Blossoms Bloom?